Time to run another little competition on my blog! 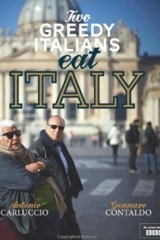 I adore the two greedy Italians and for one lucky winner I have a copy of “Two Greedy Italians Eat Italy”! I have been blogging for 15 months now and am really enjoying it! I would love a few more followers on my blog page, so simply to enter all you need to do is to follow my blog. If you are already following you will automatically be entered! Competition closes the 27th of April and is open to all! My apologies – I thought I was a follower! I’ve only started following blogs and came to find yours so it’s a bonus that there’s a competition too. Thanks for the chance to win, I’m now a follower! Lovely blog- great to find it!